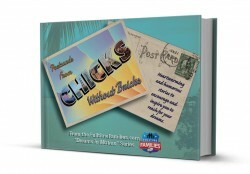 Postcards from Chicks Without Bricks is a collection of travel stories written by today’s best travel bloggers. Heartwarming and humorous, these stories will inspire you to pursue your dreams! I am humbled to be in the company of this diverse and amazing group of chicks. Along with my pair of written contributions are featured works from Margie Lundy, Nancy Sathre-Vogel, Dana Ticknor, Lainie Liberty, Laurie Sontag, Sarah Parent, Kimberly Travaglino, Jenn Nims, Jennifer Miller, and the Mother/Daughter Duo Sheri and Hanna Smith. To take advantage of the sale price of only $2.99, pre-order your copy of Postcards from Chicks Without Bricks starting today through midnight on December 23, 2013. Afterwards, the regular e-book available in iBooks and eReader formats will be priced at $7.99. This anticipated medley of tales from the road will be delivered electronically on December 24th, 2013. It would make a great Christmas present to someone you love, or even yourself! So make your list, and check it twice, for anyone you can mark off with a just-released copy of Postcards from Chicks Without Bricks. Happy Monday from the road!